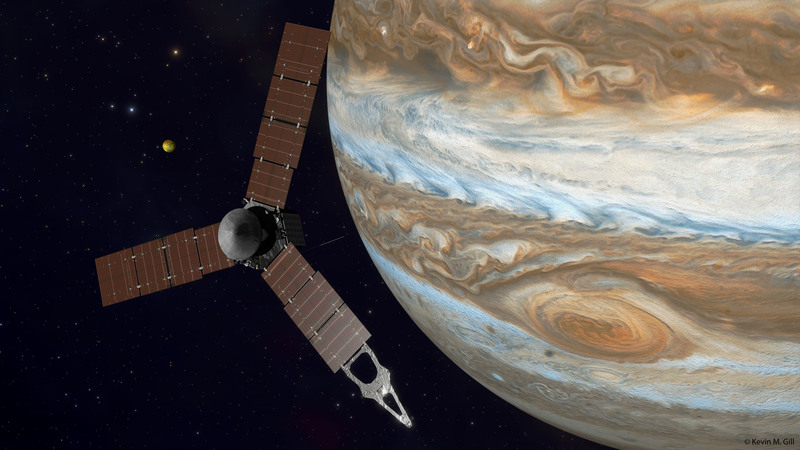 A break in Juno’s helium valves drastically shifted the mission for the spacecraft that arrived at Jupiter on July 4. Juno is currently on its fifth 53-day orbit around Jupiter, capturing epic photos of the gas giant and delivering important data to NASA scientists. The original plan was for Juno to fire its engines and move closer to Jupiter, settling into 14-day orbits. As this New York Times illustration of two-week orbits shows, not having those many two-week orbits is a big loss for humanity’s understanding of Jupiter. The two 53-day orbits were pretty much a warm-up. The problems began when NASA was checking the spacecraft’s internal systems and scientists found that the two helium check valves, which assist the engine in firing, took several minutes to open, while it took only a few seconds during past main engine firings. Happier days: The Juno team celebrates after they received confirmation from the Juno spacecraft that it had completed the engine burn and successfully entered into orbit around Jupiter, July 4. This basically means that if Juno were to attempt to move into a closer orbit, it might backfire, cutting short a $1.1 billion mission. But NASA doesn’t seem to be too worried. They are saying the continued 53-day orbit will simply offer “bonus science,” which is true, but also, it’s not going to get any of that new science it would undoubtedly collect during a 14-day orbit. Juno was originally projected to accomplish 37 total orbits and complete the mission in July 2018. Now, the mission is extended to mid-2021, delaying findings by up to three years, and that’s only if Juno can survive that long.